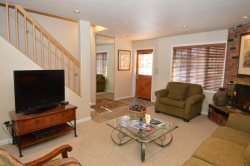 Located in the center of River Run Village, 8238 Silver Mill is a skiers paradise. You'll park in the underground and heated garage with elevator service directly to your condominium. Silver Mill's lobby is equipped with a pool table, entertainment sitting area, and fireplace. Located just outside the main lobby door are 3 hot tubs with access to the Dakota Lodge swimming pool across the courtyard. With the convenience and amenities offered to you, 8238 Silver Mill is sure to become your preferred home away from home in Keystone! This cozy and comfortable one bedroom one bathroom unit is 600 square feet and sleeps up to four people. With this Gondola Resorts unit you will enjoy being in the middle of the action. This building houses an array of shops and restaurants including Pizza on the Run, Starbucks, New Moon Cafe and 9280’ Tap House. Keystone’s Childcare Center is also located on the main floor of this building making for very convenient drop-off and pick-up of any little ones. The unit offers a fully-equipped kitchen with stainless steel appliances, for those who prefer to cook, a gas fireplace, and views of the mountains from the deck. Bedding includes a queen in the master and a queen sofa sleeper in the living area. Location, location, location! Silver Mill is just 150 yards away from the gondola. Warren Station is located just behind Silver Mill and features special events including live music, children’s activities and other year-round festivities. This unique building is modeled after an authentic gold mine and brings a touch of the old-days to River Run Village. Families will love the easy access to ice skating, inner-tubing, night skiing and the onsite pool table and game room. Contact Gondola Resorts to reserve this condo and enjoy easy access to the slopes and excitement in River Run Village!